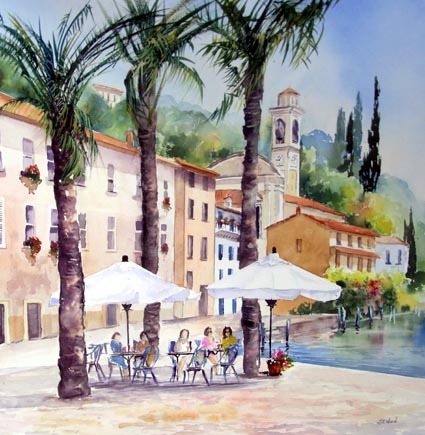 I sat and painted this gorgeous scene one warm Tuesday morning sat in the little square in Iseo Town. At around 11.30 Nonna came out onto the balcony clutching a wooden spoon, tasting what I imagined to be homemade tomato sauce.Bliss. Inspired by two beautiful old boats bobbing gently in the turquoise clear waters on a Hot Summers Day. 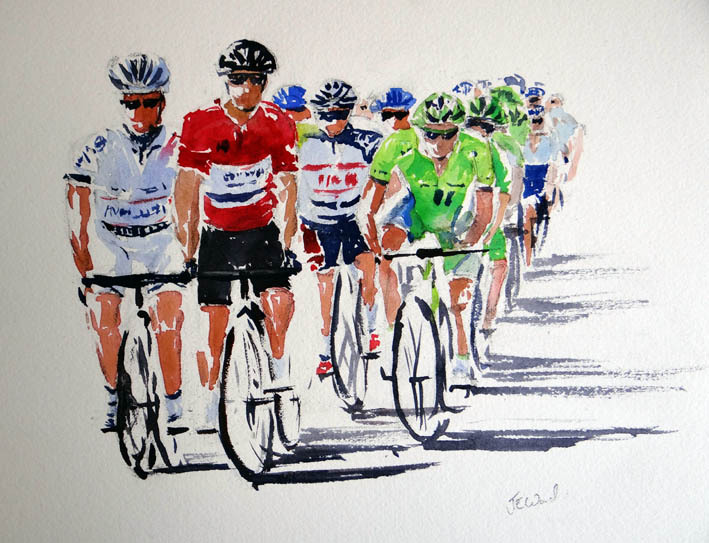 The Red jersey won by Mark Cavendish painted in watercolours. After watching the Giro d’Italia live at Borghetto, I felt I just had to put paint to paper. It made me feel so inspired and to feel this when you paint brings out the passion in your painting. Imagine a tiny village situated on the edge of a Lake, with a ferry calling in every few hours and a couple of cafes on the lake edge. 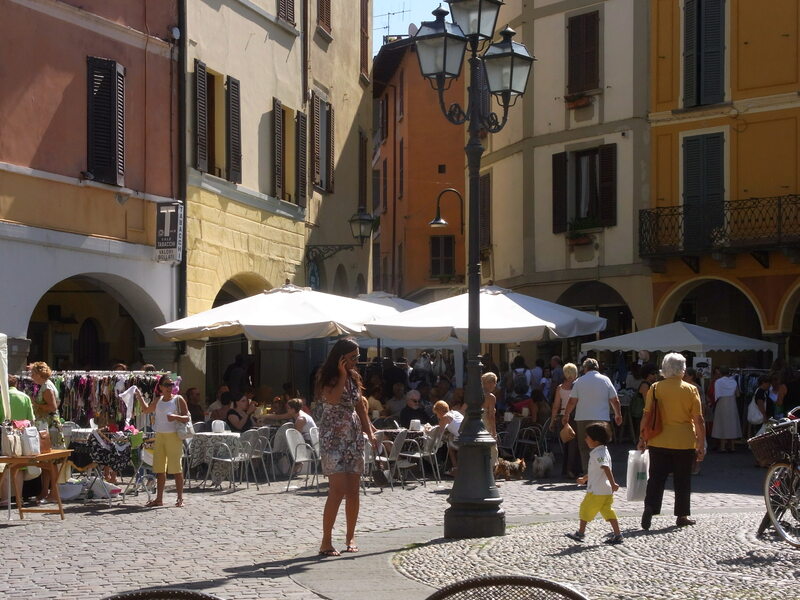 The cafe owner brings your cool drink across a quite street with a few aperitifs to enjoy. You sit back and enjoy the lazy day and watch a few passers go by. A handful of Ladies choose a table in the shade,and began to chatter while prosecco’s are passed around. 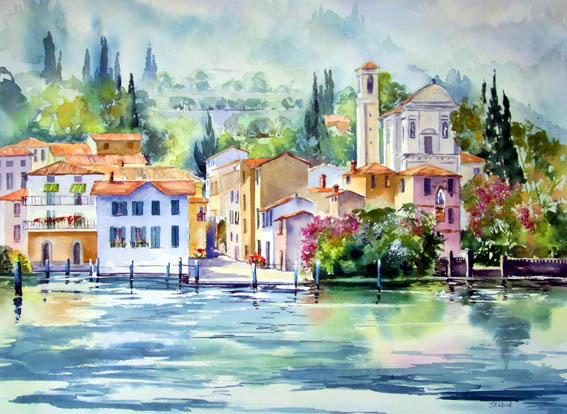 This special little hamlet is called Riva di Solta on Lake Iseo and this is what inspired me to paint ‘Ladies Lunch Italian Style. Price £50.00 including postage and packing. 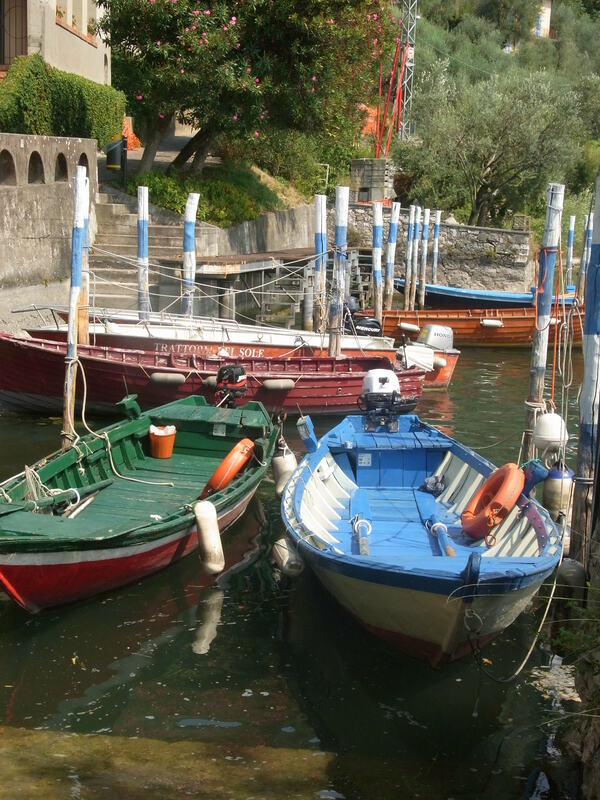 Take the ferry from Sulzano across to Monta Isola, it only takes five minutes to sail across. Walk along the shore and find a shaded spot. Ideally under an Olive tree in the warm afternoon sunshine. Gaze across the bay to the tiny village of Sensole and begin to sketch. 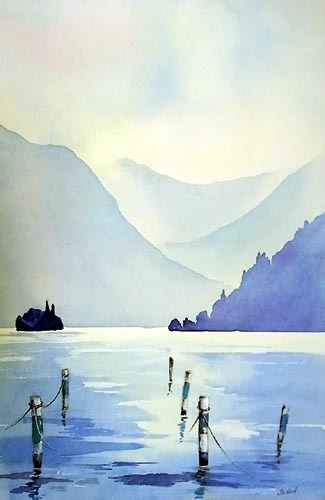 You will need to dip your feet often into the warm blue lake, this helps with the inspiration and also will help to magic the paintbrush across the paper. This is the view that welcomes you arriving by Ferry at Carzone. Just one of the hidden jewels on Lake Iseo. To paint this special little Borgo I had to get a feel and sample it’s delights. Morning coffee was first sitting in the sunshine watching scooters whizz by, riden by ladies with bags of groceries held tightly between their ankles. I was now ready for finding a location for a few hours, down the narrow alleyways with flowers and tubs beside every ancient doorway. I watched a young boy wearing his Italian strip kicking a ball and clothes above our heads drying in the morning sunshine. So now I was ready to settle down and paint an Italian scene. 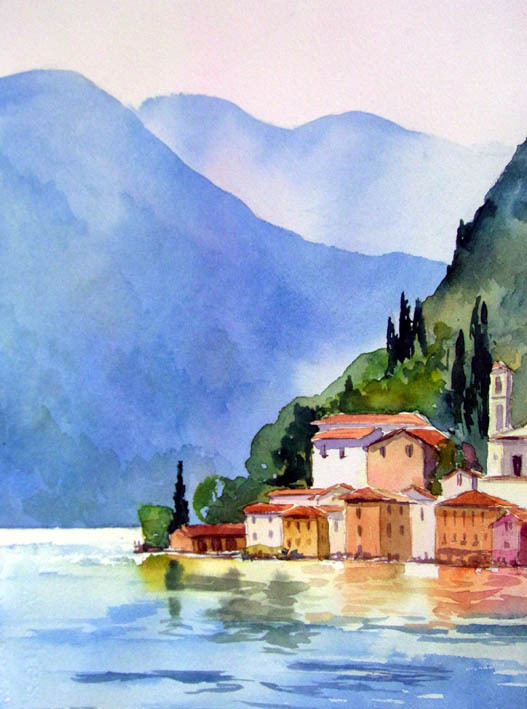 Staying at Rivalago Hotel on the shores of Lake Iseo I painted this serene vista in watercolours. With only shades of Blues to see, the palette was easy to mix. To keep it pure to the view, no pencil marks were drawn just a brush loaded with paint to show the simplicity of this breathtaking scene. The light changes daily in the Italian Lakes, the days start with sunshine flooding through the open finistra, days are spent chasing shadows around sunlight buildings or sparkling light dancing on the Lake. Late afternoon the delights come to life, a mass of colours subdue to tonal shades, shapes are simplified with just a wash of colour. 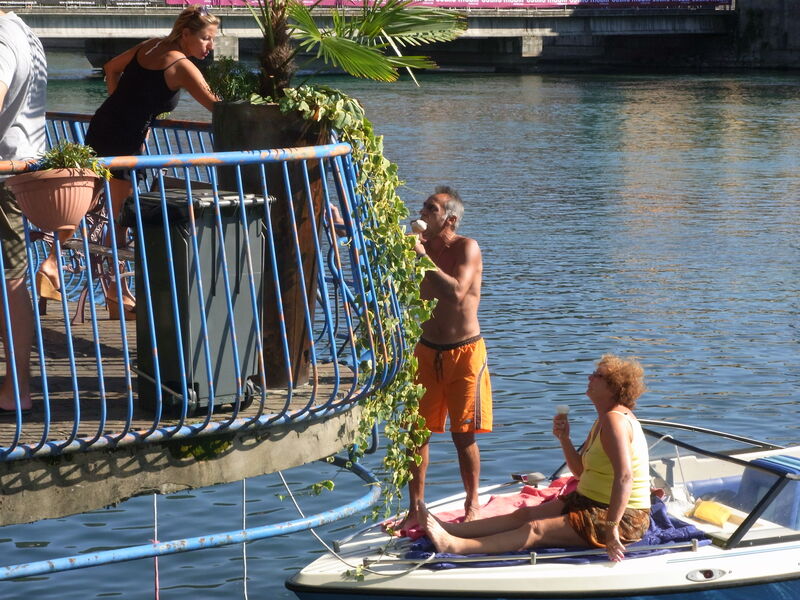 You might wonder what a painting holiday in the Italian Lakes is like? At Lake Iseo which is situated between Garda and Como. 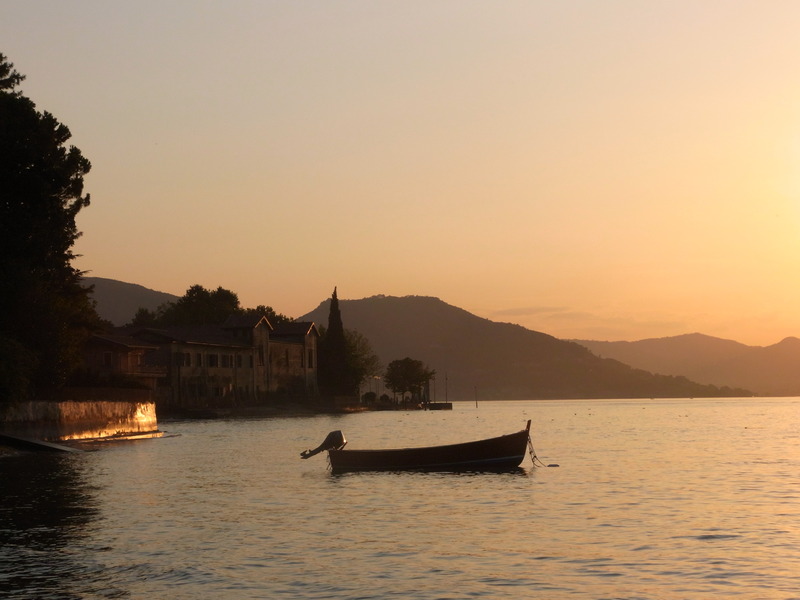 A shy but beautiful Lake is known by the Italians as the ‘Secret Jewel’ is a pure joy for artists who enjoy painting stunning scenery without throngs of tourists, but able to watch local Italians go about everyday life in a stunning backdrop. 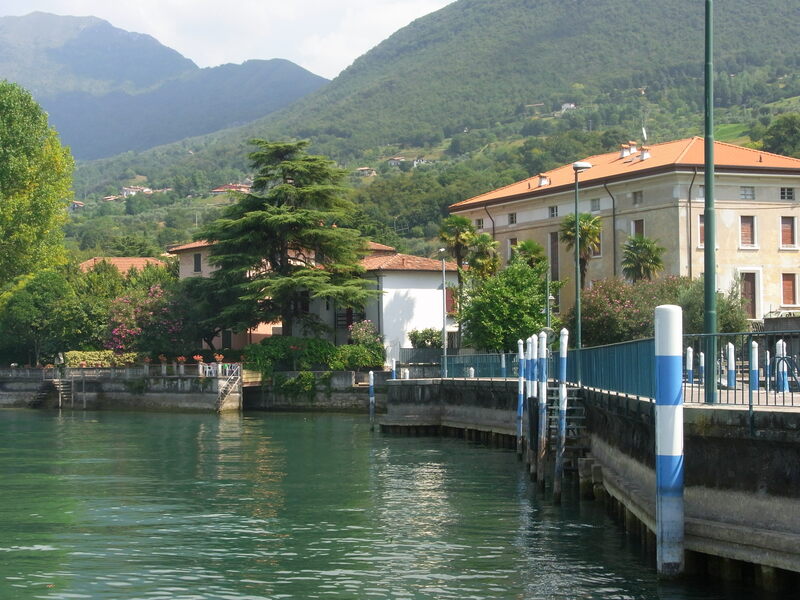 Based at the pretty old port of Sulzano in the stunning Rivalago Hotel. Breakfast time taken in the gardens leading down to the lakeshore a perfect way to start the day. Days are spent visiting the pretty small villages and towns dotted around the lakeshore, arriving usually by ferry with views from every angle. 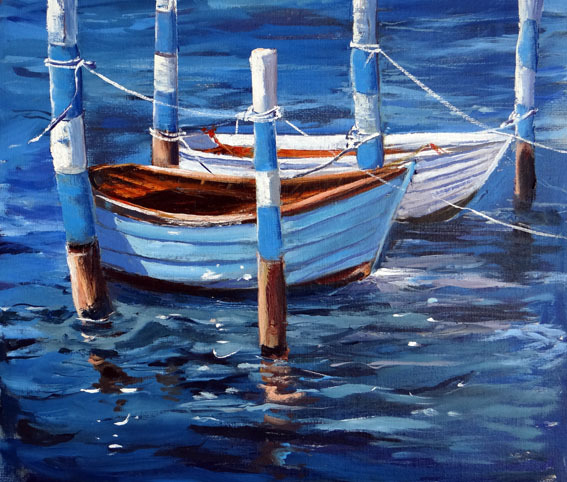 Painting subjects range from intimate balcony scenes, to bobbing boats and colourful villas reflected into a warm turquoise lake all viewed from beneath the shade of an Olive tree. Days turn into stunning sunsets with a glass of cool Prosecco to hand and homade Italian food served outdoors. Artists, be them beginners or those that have dabbled for many years all enjoying the delights of the colours that unfold. 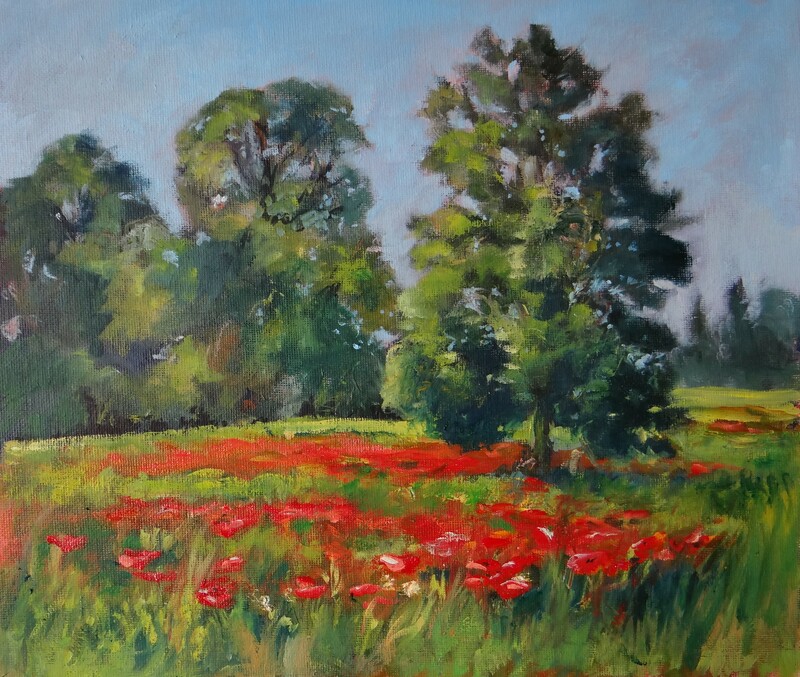 The date is Saturday 7th September for one week and the price is £995.00 for a painter and £875.00 for a non painting husband or wife. This is excluding flights. 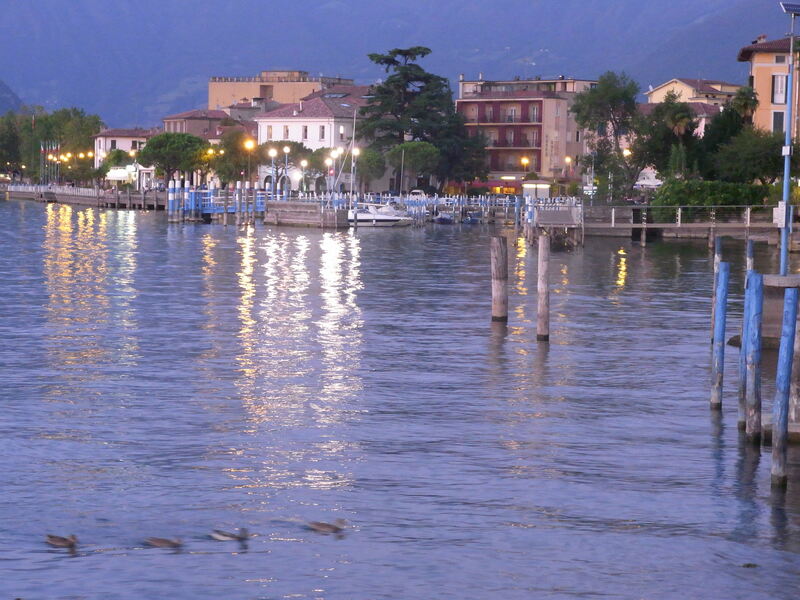 For non painters Lake Iseo is perfect for Road cycling, walking and just enjoying Italian Culture.